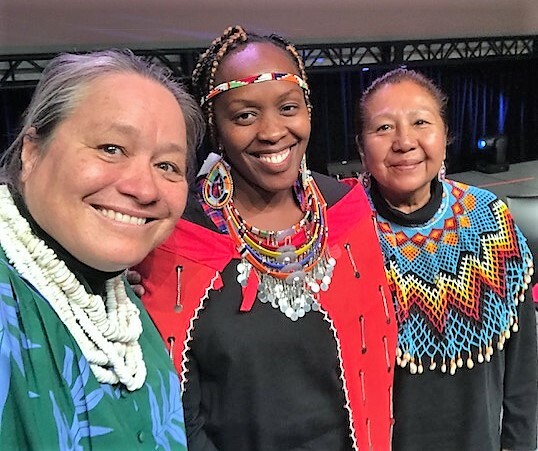 Dr. Manu Aluli-Meyer spoke on a panel with Naomi Lanoi from the Indigenous Maasai community of East Africa- Kenya, and Debra Harry of the Kooyooe Dukaddo Band of the Northern Paiute. Dr. Manu Aluli-Meyer, UH West Oʻahu’s Konohiki of Kūlana o Kapolei, gave a keynote address last week to the The 2018 Parliament of the World’s Religions in Toronto, which attracted more than 9,000 persons of faith and conscience from 80 nations and more than 200 unique spiritual backgrounds. She also was a panelist during the parliament’s Indigenous Peoples’ track, giving her thoughts on Indigenous Women and Spirituality. She appeared on the panel alongside Debra Harry of the Kooyooe Dukaddo Band of the Northern Paiute peoples, and Naomi Lanoi, from the Indigenous Maasai community of East Africa- Kenya. The Parliament of the World’s Religions was created with the idea of cultivating harmony among religious and spiritual communities across earth and to foster their engagement in achieving a just, peaceful, and sustainable world. The 2018 Parliament included Indigenous Peoples Program as part of the proceedings with organizers noting the program provided a platform for “Indigenous wisdom traditions to take their place alongside all world religions” and possibly provide inspiration and sacred guidance for humanity as it grapples with the challenges of climate change, violence, war, genocide, economic disparities, food shortages, the disappearance of reservoirs and extinction of species. The 7th Parliament of the World’s Religions was a seven-day long event with more than 500 programs, workshops and dialogues that takes place alongside music, dance, art and photography exhibits presented by the world’s communities and cultural institutions. Prior parliaments took place in Chicago (1893), Chicago (1993), Cape Town (1999), Barcelona (2004), Melbourne (2009), and Salt Lake City (2015). Tagged 2018 Parliament of the World’s Religions, Indigenous Women and Spirituality, Konohiki of Kūlana o Kapolei, The University of Hawaiʻi-West Oʻahu, www. Bookmark the permalink.